Who will profit from colocation the most then? The answer we have for you is rather unsurprising – all companies actually which either do not posses their own data center infrastructure at all, or have one, but the decisive parameters do not meet the expected standards. Through colocation, these businesses automatically gain the uppermost level of security, accessibility, and infallibility for their precious data, without the need to invest in a pricey server room infrastructure. As you can see, if your enterprise requires a stable, high-speed connection, colocation is the least money-draining way to go. High bandwidth at a fraction of the cost, no necessity to make space for a server room, and no reason to worry about power outage – we could enumerate at least a few more pros. Now that you are well familiarized with the multifaceted advantages standing behind this clever service, let us move to the know-how. The possibility to manage colocated devices has been introduced to newly rolled out EasyDCIM v1.4.3, which makes it all the more attractive. You can differentiate between colocation and other network devices real quick as the former type has a set of its own, characteristic attributes. Ready to embark on a journey through some of them? Navigate to the left sidebar → ‘Services & Devices′ → ′Colocation′. Here you will find colocation-related details of various sorts, including its name, set-up location, and a total number of active devices. But that is certainly not all this section provides you with. If you are eager to learn more about your data transfer usage or electric energy consumption, you will have it delivered to you in an absolutely crystal clear, graph form. What needs to be stressed at this point is also the fact that each colocation can have an unlimited number of servers assigned to it and their complete record can be easily accessed from the summary view in the ′Devices′ subsection. Now, moving to the ′usage′ part. 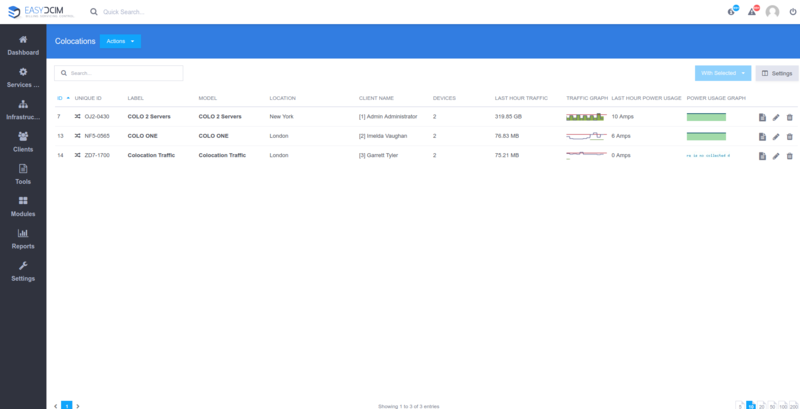 EasyDCIM aggregates network traffic from all devices assigned to colocation altogether. For example, if three servers operating within one colocation generate different incoming and outgoing traffic, then the overall traffic for the whole colocation will be simply a total of all sums. This solution is not only pretty straightforward, but also extremely accurate, as it allows administrators to charge their clients, via a billing system like WHMCS or Blesta, on the basis of either the total usage or through the 95th percentile billing method. Naturally, each of the devices must be appropriately configured in terms of traffic aggregation beforehand by assigning a server to a specific port on the switch. 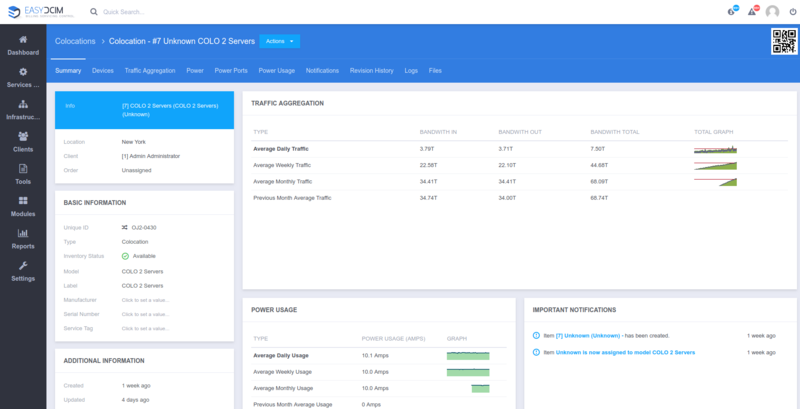 Empowering you to manage the colocated servers now straight in your EasyDCIM is yet another quantum leap towards greater Admin Experience we are so adamant about. No leading-edge data center control panel would be fully complete without this widely popularized service which makes us positive that you will find it particularly serviceable too. If our brief reading struck you as informative or interesting, stick with us for more articles dedicated to ins and outs of colocation!